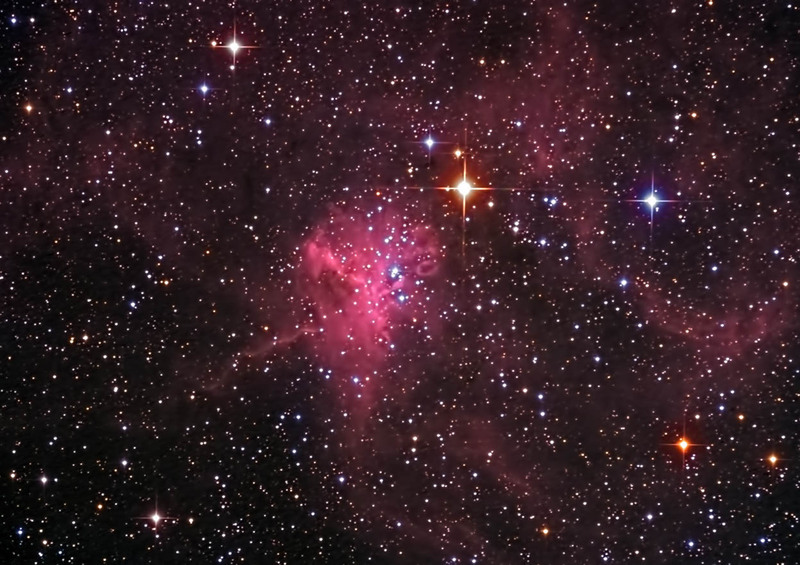 IC is an emission nebula in the constellation of Auriga. It is often overlooked as it lies near the much more commonly observed nebulae IC 410 (the Tadpoles) and IC 405 (the Flaming Star). It is sometimes referred to as the Spider Nebula as it appears to be attacking the nearby Fly Nebula (NGC 1931 - not pictured). Exposures: Color: 24 @ 5 min. Ha: 24 @ 7.5 min. Processing: Color subframes were captured, aligned, and combined in ImagesPlus. Ha subframes were captured, aligned, and combined in CCDSoft. The component images were aligned in RegiStar; they were combined adjusted in Photoshop. Topaz Detail and DeNoise were applied.